Spiders, Scorpions, Centipedes and Mites provides information pertinent to different species of insects, including woodlice, millipedes, centipedes, scorpions, and spiders. This book presents the complexity of factors influencing the distribution and ecology of animals. Organized into 11 chapters, this book starts with an overview of the characteristics and different adaptation to life on land of woodlice. This text then provides information on the structural characteristics of the different orders of millipedes, including Oniscomorpha, Limacomorpha, and Colobognatha. 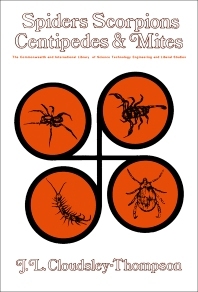 Other chapters consider the biology of centipedes wherein the body is divided into a variable number of somites, each of which is provided with a pair of limbs used for locomotion. This book discusses as well the large pedipalp furnished with stout chelae, which is the most striking feature of spiders. The final chapter deals with the stages in the development of mites. This book is a valuable resource for zoologists, upper school biology teachers, and university students.